It’s almost that time of year again. I can practically feel it in the air. While the seasons are slowly changing (they can’t seem to make up their mind, ricocheting between cold and too warm for a jacket) my head has been filled with a story idea that needs to be shaped. 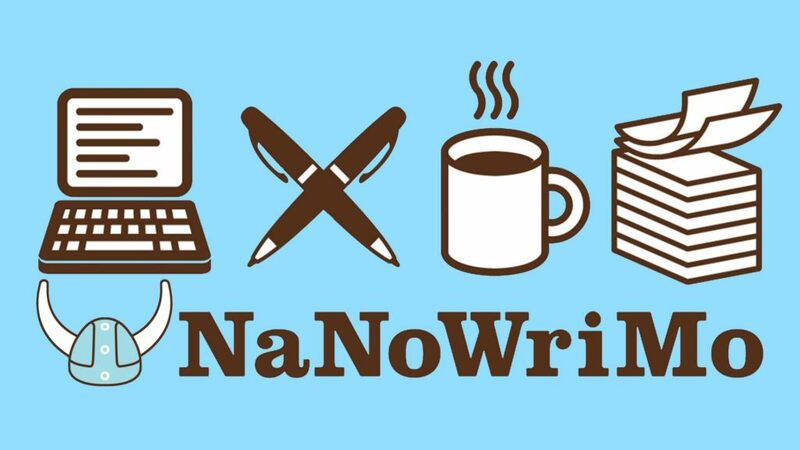 That’s right, it’s Nanowrimo time. For those of you who aren’t savvy on what Nanowrimo is, it stands for National Novel Writing Month and is basically a tool to propel writers into actually going and writing their novels by setting a goal. Each participant is challenged to write 50,000 words in one month. So you have 30 days to write what would amount to a short novel or a novella. What I’ve been trying to challenge myself to do this year is to finish the entire novel in one month. So that’s anywhere from 80,000 to 100,000 words in one month. I’m not crazy, don’t look at me like that. There are people who write half a million words in the month and that for me is something which takes a crazy amount of dedication and well, craziness. It’s going to be a month of staying up late, burning the candle at both ends and pushing myself to the very limit in order to produce that much writing in such a short amount of time and it’s brilliant. There is a good amount of stress involved though. You set goals and you have to keep yourself to them. If you don’t, you’ll find that the word count that you need to make up is growing larger and larger which usually ends in the person quitting. There’s something wonderful about Nanowrimo though which keeps me coming back. This will be the second year in a row that I’m doing it and the planning has been underway for nearly a month. The problem with the planning though is that I’m the type of person who works best with a sense of urgency behind her, so it’s only in this last week or so that I’ve really started to kick myself into gear. It’s coming together slowly. A playlist is needed, but the character sheets are almost done, the plotting outline is halfway there and by mid-next week while other people are trick or treating, I’ll be asleep so when midnight comes I can just start writing. But this is becoming a very boring, all about me blog post so I should probably find something else to say. The problem is that it’s almost impossible when it gets around this time of year. Everything leads back to Nano in the end, so I’m afraid that all of my blog posts are going to revolve around it for the next month or so. When I’m at work, I’m day dreaming about it. When I’m heading to work, I’m plotting in my head and fleshing out the characters. Whenever I’m listening to music, it’s music pertaining to the novel I’m writing. Nano is the one time of year where I throw away absolutely everything else and just write. While writing always takes up a large portion of my life, Nano is the time when no matter what the occasion (barring emergencies, of course) writing takes precedence. If friends want to go out, no can do. If I’m asked to work over time, I can’t. Even family gets shunted to one side for a crazy whirlwind month, but the end product is so worth it that no matter how often I complain about Nano, I’ll always go back to do it again. So please, if you get a chance to check out my Nanowrimo profile, do so.